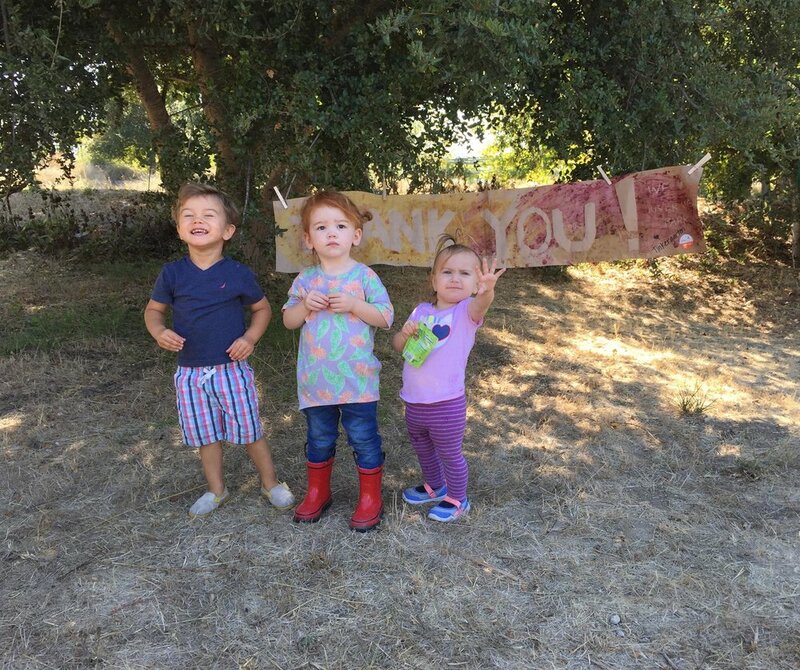 The Santa Ynez Valley Botanic Garden, adjacent to River View Park in Buellton, California is now hosting two outdoor preschools. The Acorn School allows children to explore, make tea with their own solar stoves, and become comfortable with the dynamics of their natural environment. Through such interaction they build confidence, learn problem solving skills and think creatively both independently and working as a group. Tinkergarten is an outdoor play-based class for children 18 months to 5 years old that centers on a child’s wonder and curiosity with activities that emphasize critical developmental skills like persistence, problem solving, grit, creativity, and imagination. Both schools have wonderful crafts and activities that are based on discovered objects and plant materials found in the garden. One of the Garden's goals is to provide an outdoor educational setting that is accessible to all types of learning experiences from preschool and elementary levels to community service through middle and high school years. At Arcadia, we are committed to connecting to our communities through the natural world. Our firm is pleased to learn its extensive work at Cottage Hospital is being recognized by Soliant Health as one of the 20 most beautiful hospitals in the country. “With an innovative healing arts collection and ‘River of Life’ fountain that flows through the gardens of the hospital’s new Spanish Colonial inpatient wing, this Santa Barbara landmark accomplishes one of the great triumphs of hospital architecture: Letting you forget that you’re in a hospital,” Soliant Health stated in its official announcement of the award. Derrik Eichelberger, Principal at Arcadia Studio has been selected to assist with the renovation of the Japanese Garden at Lotusland in Montecito. One of Madame Ganna Walska's last great projects, the garden was designed during the 1960's with the assistance of Frank Fuji and Ossie DeRos. Derrik teamed up with Paul Comstock of Comstock Landscape Architecture in Santa Monica to create a team that understands the subtleties of Japanese Garden style and design, but which also has the historic sensibility to tread lightly on one of Ganna Walska's signature gardens at Lotusland. Gwen Stauffer, Executive Director at Lotusland has described the project as the most significant renovation project at Lotusland since Madame's death in the early 1980's. 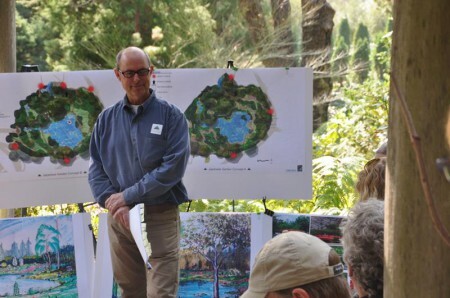 The goals of the project are to improve the clarity and configuration of the main pond to make it more attractive; to improve the path system throughout the garden in order to make it more accessible for disabled guests; and to restudy the garden as a whole to improve the relationship between the existing elements to make the overall experience of the garden the best that it can be. Work on the preliminary plans began in January and are near completion. We're honored to be named recipients for awards this year! The ceremony will take place on September 28 at the Music Academy of the West. Something to look forward too! Water levels in our wells are dropping and lakes and reservoirs are at all time lows. Everyone should be pitching in. So what are the two most important things you can do to help manage our community’s dwindling water resources? For many homes, more than 60% of residential water use can be attributed to garden irrigation. For some gardens, use can consume up to 80% of domestic water use. So given these statistics, we should focus on water use in our gardens in our to make real inroads in water conservation. So let’s keep it simple. In many cases, water is wasted due to poor management. Have you looked at your irrigation controller? Do you really know how much time is on each station? In one case, just by helping a client adjust his timer, we reduced his water use by 50%. Are the heads really adjusted to cover green areas or is a lot of water ending up in the street or sidewalk? Is your system older than 15 years? Many advances have been made in irrigation technology. Pipes age and you may have small underground leaks. Consider a retrofit. Give your lawn a haircut. For many homes lawn can be reduced by 30 to 50% without losing any real function or residential recreation potential. Often lawns are installed on slopes, side yards and other non-functional areas. Take an inventory and determine where you can lose some lawn. These lawn areas can be easily replaced with native or other drought tolerant groundcovers or inert materials such as gravel or decomposed granite. If you would like to learn more, the Santa Ynez Valley Botanic Garden, WEWATCH and the Los Olivos Grange will be hosting a Water Conservation Workshop on Saturday afternoon, September 20th just in time for fall renovations and garden retrofitting. For more information, go to the SYVBG website. On Saturday, at the annual I Madonnari, eight students of the Visual Arts & Design Academy (VADA) beautifully rendered the image of the 2014 Summer Solstice poster. This was the fourth year Arcadia Studio sponsored a "square" featuring the Summer Solstice poster, and the third year the hard work was cheerfully and skillfully executed by VADA students. Artwork is by Pali X Mano, one of Solstice's regular returning artists. Photo published with permission of Robert Bernstein. Arcadia Studio is proud to contribute to the Children's Creative Workshop. This was our 25th year of participation. Our sincere thanks to VADA, Children's Creative Workshop, and the Summer Solstice Celebration for the opportunity to once again work with such a wonderful group of people promoting the arts in Santa Barbara! Derrik Eichelberger hosting garden tour May 17th. Register to join in! Derrik will be hosting a tour of the McDonough Residence. The garden for this historic Carleton Winslow-designed hacienda-style home was created over the course of a decade. Working closely with the owners to maintain the original eclectic feel of the garden, spaces were massaged to bring out their greatest potential, including a new koi pond, new pool, barbecue and entertainment terrace, new meadow garden and a new garage and motor court. "The Board of Supervisors finds that inappropriateness or poor quality of design in the exterior appearance of buildings, structures or signs adversely affect the desirability of the immediate area and neighboring areas for residential, business or other purposes and by so doing, impairs the benefits of occupancy of existing property in such areas, impairs the stability and value of both improved and unimproved real property in such areas, prevents the most appropriate development and use of such areas, produces degeneration of property in such areas with attendant deterioration of conditions affecting the health, safety and general welfare of the county and destroys a proper relationship between the taxable value of real property in such areas and the cost of public services provided therefore." If any one is up to the task, it's Laurie! Arcadia's principals have a long and on-going record of public service in this regard. Derrik Eichelberger currently serves as Vice Chair on the Montecito Board of Architectural Review and Bob Cunningham sits as the Vice Chair on the Street Tree Advisory Committee Sign Committee, City of Santa Barbara, and Chairs the Historic Landmarks Advisory Commission. Arcadia celebrates Monte Vista’s new ‘front yard’. Monte Vista Elementary School celebrated a newly-landscaped "front yard" this morning with all students in attendance. Situated on upper Hope Avenue, the project involves new "water-wise" plants, replacing a lawn that had deteriorated, since the school's budget was unable to sustain the amount of water required to keep it healthy. The project was begun four years ago, with a design by Arcadia Studio, provided at no cost to the school. After extended efforts to obtain adequate funding, Principal Nancy Lorenzen and her PTA managed to get materials donated or sold below cost from Agri-Turf Supply, West Covina Wholesale Nursery and San Marcos Growers. Arroyo Seco Construction prepared the site and installed a new drip irrigation system and hundreds of new plants, at their cost, and Thomas Shawl Landscaping installed a new decomposed-granite parkway strip, removed substantial numbers of weeds and invasive Ivy, and continues to wage war on the resident gopher population. A key benefactor in the success of the project was Santa Barbara Beautiful, one of our most effective organizations in facilitating new landscaping projects by assisting schools and other deserving organizations, and for planting thousands of new street trees. Without Santa Barbara Beautiful's key financial support, the project would still be on the drawing board. Our thanks to all who helped with this great project! A great article about a beautiful project in Carpinteria designed by Arcadia is currently the headline over at WLM. Check it! Written by Billy Goodnick for Santa Barbara Ed Hat. Thanks, Billy, for such a kind tribute. Check out the article here. Featured in the August issue of Architectural Digest is our very own Carol Puck Erickson. The article is a feature on a new addition to Montecito's tradition of masterpieces, for which Carol designed the landscape. "We wanted to let nature sneak in and dable with the edges of the house's disciplined composition," Carol says in the article. Here's a link to the article and a slide show of this wonderful property. Here's a great article highlighting the work Arcadia Studio has done for the Patagonia headquarters. Thanks to the Visual Arts & Design Academy at Santa Barbara High School for completing a wonderful chalk version of this year's Solstice Parade poster. The drawing was done this past Memorial Day weekend, and a great time was had by all. We couldn't be happier to announce: Our very own Martha Degasis has received the coveted Lockwood de Forest Award for her landscape architectural work at the Santa Barbara History Museum. It is the highest honor the City of Santa Barbara can bestow for such work. The award is not given out annually but only when a particular site design rises to the prestigious award's high standard. If you've ever visited the museum you understand why the landscape, finished in 2009, is deserving of the de Forest prize; its understated design is a perfect example of a landscape that appears to have been there forever, as if a product of nature. It is a harmony of native plant gardens and stone hardscaping that evokes the history of the West while also being perfectly functional when the venue hosts weddings and other gatherings.